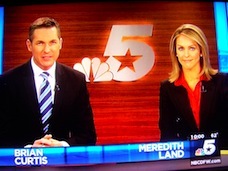 Readers have been asking whether the new surroundings for NBC5's news anchors are the planned revamp noted in a previous unclebarky.com post or a temporary fix until the makeover is completely finished. Brian Hocker, vice president of programming for the Fort Worth-based station, says that this is it. "You're seeing our newly modified set," Hocker said in an email reply Wednesday. "As with all set changes, there may be some minor tweaking in the days ahead as we settle into newscasts." 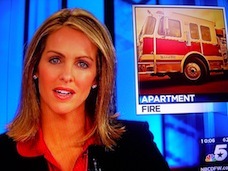 The bottom left shot generally is used to open newscasts and as a bridge in and out of commercial breaks. Bottom right shows the new look for single anchor readings. 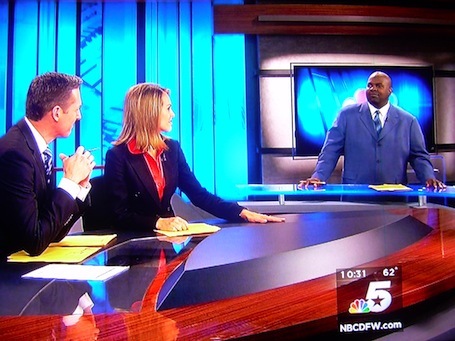 On top is a more panoramic shot used during sports anchor Newy Scruggs' brief nightly mini-chat with news anchors Brian Curtis and Meredith Land. It's a pretty basic look, all in all. But it's not off-putting. Now if WFAA8 could at last rid itself of that fuzz guitar music that bridges breaks in its newscasts. It's long outlived whatever heyday it might have had. Hocker also re-confirmed that NBC5 still plans to relocate from the only home it's ever had at 3900 Barnett St. in Fort Worth to the Centreport office park south of Dallas-Fort Worth Airport. "But the details are still being finalized," he said.